In 2017 , the global cumulative electric vehicles market sales has surpassed 2 million units, with the growth continue to expand in the major market of China, Europe and United States. Moreover, the government regulation in these regions to achieve energy conservation targets, climate change and industrial development goals ha significantly supported the growth of electric vehicles market. Electric vehicle adoption is majorly linked with the government incentives that reduce the effective electric vehicle cost. In United States the major metropolitan areas with the highest electric vehicles sales are providing consumer incentives typically worth USD 2,000 to 5,000 which are likely to expand the growth of electric vehicles in coming years. However, after significant expenditures over charging infrastructure the present charging infrastructure in United States is insufficient for the mass adoption of electric vehicles in the region. Goldstein Research analyst forecast the United States electric vehicle market to expand at a CAGR of 40.7% during the forecast period 2016-2024. Further, the market is anticipated to reach USD 43.10 billion by the end of forecast period. The report covers the present ground scenario and the future growth prospects of the electric vehicles market for 2016-2024 along with the total revenue of electric vehicles in every region. We calculated the market size and revenue share on the basis of revenue generated per segment, region and country level. The revenue forecast is given on the basis of number of major players and current growth rate of the market. On the basis of vehicle type, passenger cars dominated the United States electric vehicle market with 60% share in 2016 owing to rapid adoption and declining prices of faster and efficient electric vehicles. Further, the passenger cars are likely to dominate the U.S electric vehicle market over the forecast period, expanding at a CAGR of 48.1 percent. United States Electric Vehicle Market Outlook 2016-2024, has been prepared based on an in-depth market analysis from industry experts. The report covers the competitive landscape and current position of major players in the United States electric vehicle market. The report also includes porter’s five force model, SWOT analysis, company profiling, business strategies of market players and their business models. United States electric vehicle market report also recognizes value chain analysis to understand the cost differentiation to provide competitive advantage to the existing and new entry players. 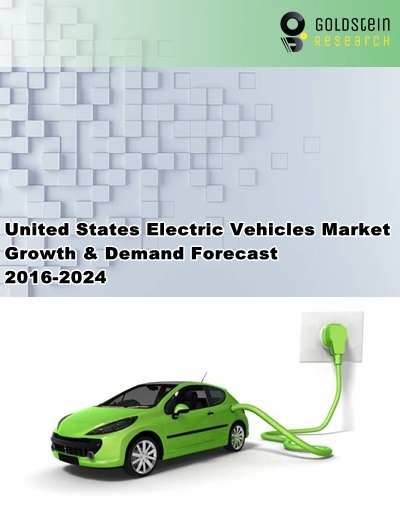 Our United States electric vehicle market report comprises of the following companies as the key players in the United States electric vehicle market: Toyota Motor Corporation, General Motors Company, Tesla Inc., Nissan Motor Company, Ford Motor Company, Volkswagen, Volvo, Mercedes Benz (Daimler AG), BMW, Audi AG, Fiat S.p.A and Mitsubishi Motors Corporation. According to our United States electric vehicle market study on the basis of extensive primary and secondary research, one major trend in the market is the rapid declining cost of electric vehicles. In mid of rapid growth of electric vehicle sales, electric vehicle’s battery manufacturers are developing cost effective batteries that have put electric vehicles on track to pass conventional vehicles. Indeed, U.S. EV sales have grown an average of 32% annually from 2012-2016 and 40% over the year ending June 2017, the EVs sales are set grow in coming years also. According to the report, major driver in United States electric vehicle market is strong policy support from state and local governments. Government in United States is providing various monetary and non-monetary benefits to the electric vehicle customers in order to support mass adoption of EVs. For instance, EV Consumers in California markets and Salt Lake City were offered both EV purchase incentives and carpool lane access. Further, the report states that one challenge in United States electric vehicle market is insufficient development of public charging infrastructure. To bring the nascent EV market into mainstream phenomenon in coming years, continued expenditures over charging infrastructure and to reduce barriers to low-cost home charging are required in order to fuel the EVs market growth. North America region accounted for the market share of 38% revenue share in global electric vehicles market. United States in North America electric vehicles constitute a lion share of USD 31.3 billion which is likely to expand at a CAGR of 40.7% over the forecast period. Moreover, California in U.S accounted for the highest revenue share and provides immense growth potential for the market growth in future.